It’s not a secret that for the majority of customers, the key question associated with mobile app development lies in its cost. Also, it’s common for all of us to be interested in getting a high-quality product at a reasonable price. Mobile application development cost may vary significantly depending on different factors. Most of them are listed below. Let’s take a deeper view on each. Let’s take some average hourly rate on the development $50. According to the picture above, a simple mobile application might cost from $20,000 to $30,000; a middle complexity app will vary from $30,000 to $40,000; prices on complex mobile applications will start from $50,000. 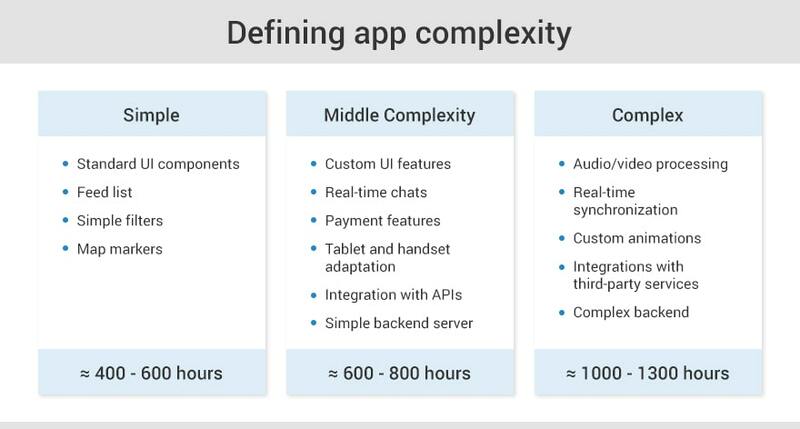 When it comes to the average time needed to develop an app, it starts from 400 hours. Still, note that development time also depends on the technical complexity of the desired app, number of talents working on it, number of devices and OS, custom designs and animations, and so on. Also, quite often, but not exclusively, Android app development takes 10-20% more time than application development for iOS, meaning that the cost of Android app often exceeds the cost of iOS one. The price of an app might vary depending on the place where it is developed. 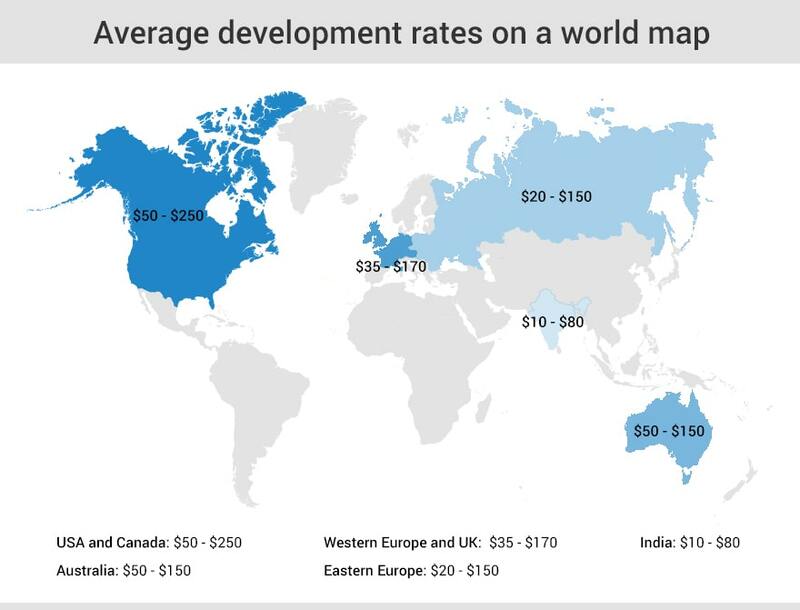 In some countries the prices on the development are sky-high (US, Canada) whereas some others provide quite reasonable prices. Considering such difference in hourly rates, there is no wonder many US and Canadian customers are looking for outsourcing software development providers. Nevertheless, there are also those who wrongly believe that the higher the price — the better is the quality. In fact, middle and lower-priced mobile app developers are often known for providing excellent results. 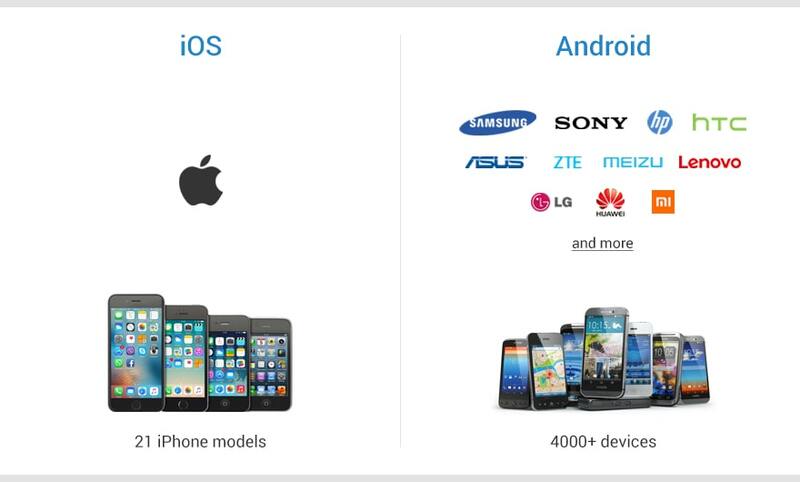 So let’s move on and look at the mobile app development companies. Meanwhile, the size of the vendor company might depend on the price of the development. As a rule, the larger is the company — the higher is the price. As seen, the price of mobile application development offered by the freelancers is much lower than the price offered by mid-sized providers. The size of the development team also affects the price of the app. The larger the project and the higher the requirements — the more programmers should be involved in the development process, and, as a result, the higher is the overall price. Conditionally, we can subdivide teams into basic and extended. Need a mobile app estimation? At SCAND we implement an individual approach to each customer. Mainly because the project requirements differ from customer to customer. Some might have just an idea or a brief project description, while others – comprehensive information on the project (documentation, design, mockups, wireframes). In the first case, you might get only a rough project estimate, in the second – a detailed cost breakdown. The more information we get – the more detailed will be the estimate. Keep in mind that although price estimation is the domain of the contractor, your involvement in the process — provision of relevant information, clear requirements and mission statement — have a strong impact on both its accurateness and the overall productiveness of your relationships with the contractor.